- DNA tested and clear for the PRA mutation NHPH4. 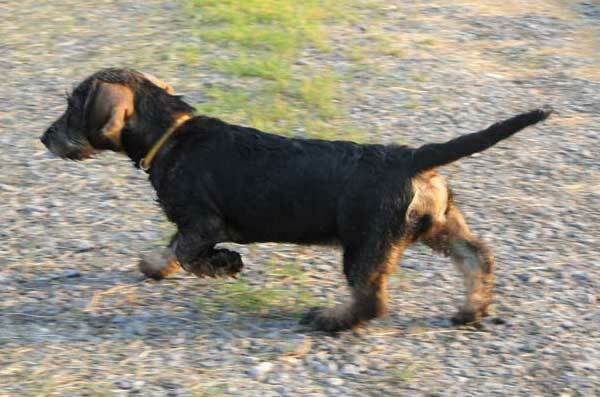 - DNA tested and homozygous for the gene controlling the presence of furnishings (beard), which means that all Paika's offspring should be wirehaired as she does not carry the gene for short hair. 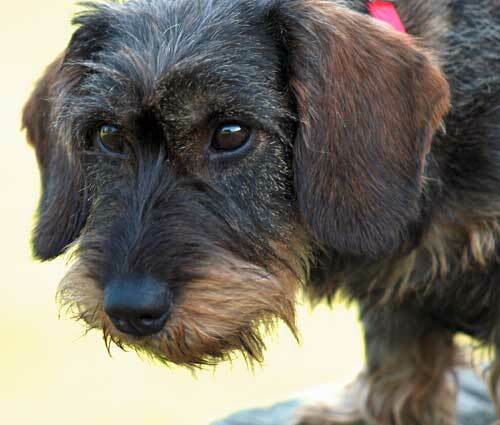 Paika's dam is FC Keena v Moosbach-Zuzelek, and her sire is a French teckel who lives in Quebec - Dutheo de la Meute a Cheops aka Théo. If you look at Paika's pedigree, you will notice that on the maternal side Paika goes back through Keena, Gilda, Sabina to Gerte vom Dornenfeld whom John imported from Germany 24 years ago. We know this bloodline very well, and all these females have been excellent producers of blood trackers. 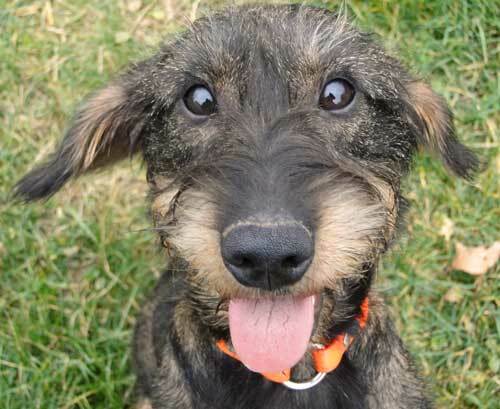 When Stan Kite spent some time with young Paika at a field trial in Maryland, he asked for a puppy just like her. I wish we could clone her. She is very intelligent and has a wonderful temperament - she is friendly, outgoing, affectionate, very responsive and trainable. Calm and focused she is a pleasure to handle at field trials as she does not get too wound up. 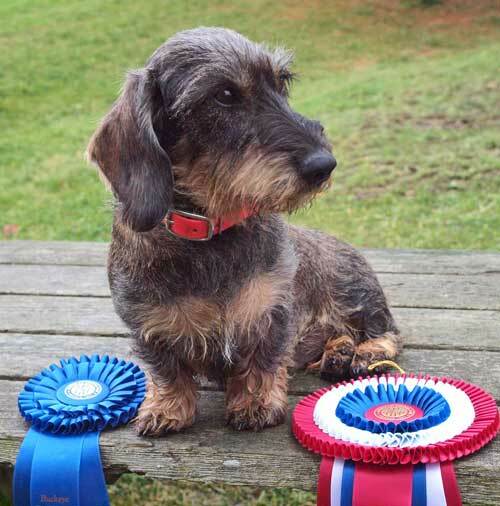 Her conformation was judged by a German judge, Heike Behring, "excellent" at an NATC Zuchtschau on June 20, 2010. Her type was described as "compact", coat "dense/harsh with well developed undercoat", movement "ground covering". At 15 months her weight was 9 kg (20 lbs), and her chest circumference 42 cm. She got her AKC field championship very easily and has been doing well competing in a field champion stake. In November 2010 she got her first Absolute win at a field trial in Ohio (hopefully not her last one). Paika has the right balance of prey drive and line control, and we are very impressed by her check work. She trails rabbits at the medium speed and opens freely on them; her use of voice is very correct. She has showed a good game aggressiveness. Paika has not done much work on natural lines of wounded deer. However, she shows excellent desire, line control and focus on training lines. 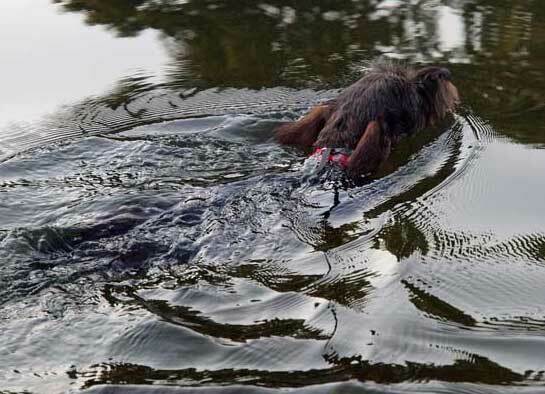 Paika loves to swim and you can see her love for water in one of the videos listed. 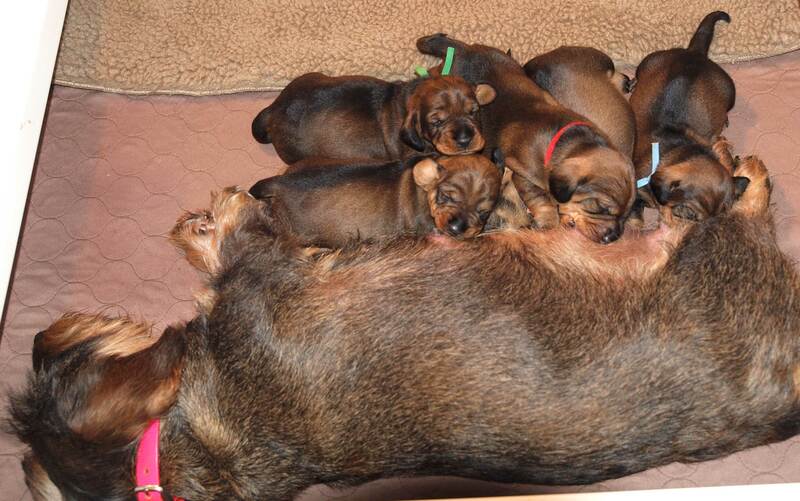 On August 4, 2011 Paika whelped a litter of five "S" puppies - one females and four males. It was a natural whelping. The sire was FC Nurmi v Moosbach-Zuzelek (aka Moose) owned by Chuck Collier from Hillman, Michigan. So far the litter looks like one of the best we have ever bred. We could not be happier with the feedback from the buyers of these pups. Paika's build is strong and athletic. 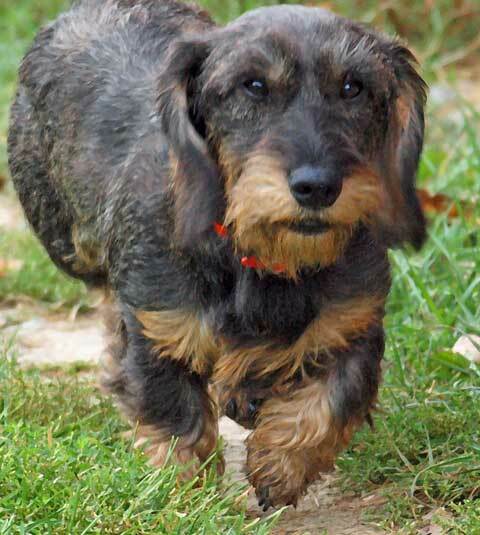 On August 4, 2011, Parka whelped 5 puppies: Summer, Sky, Strut. Storm and Shome. More info on the puppies and their progress is available on our puppy journal. This is how Paika looked like when she was a young pup.